Remote desktop is a powerful service to make your online business more flexible and helps connecting with your clients in an easier way. It helps projecting your business as a brand to your clients. So if you are having or are thinking to start an online business then Techline Remote desktop service is the best to consider. 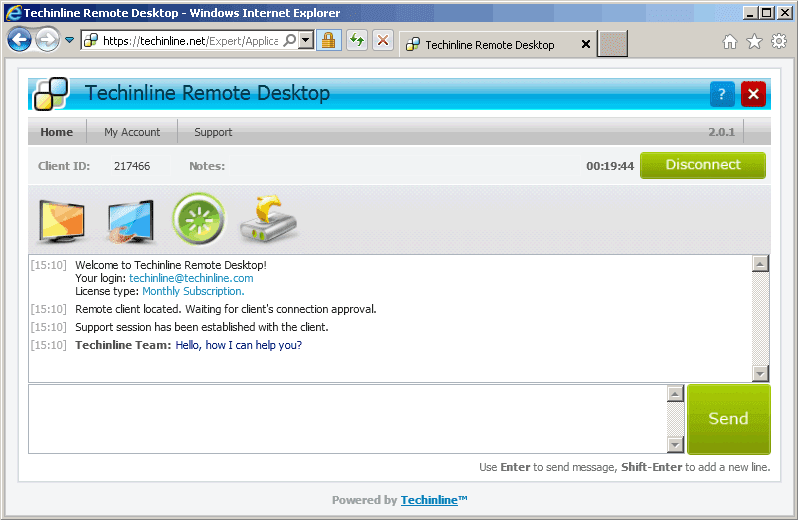 Let us have an insight of the Remote desktop and Techline technology. Remote desktop allows you to connect to another computer remotely. No matter on what continent the systems are present, by remote desktop you can access the other computer. So you can access your office computer or home system or you can even handle your client’s problem by sitting at your system. 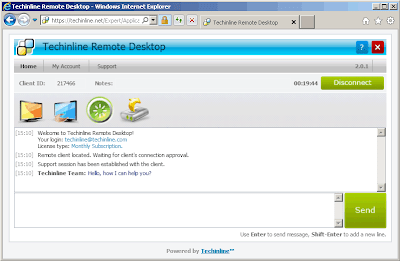 Techline - Remote Desktop Software tool which provides secure, instant and hassle free connections between peers over the internet. The Techline remote service tool targets everybody from large and medium sized business to small firms and ordinary users. Techline has this flexible target and an affordable price which attracts everybody towards it . It is not as expensive as other remote access tools already available in the market. Techline’s major advantage is that it doesn’t require to be installed on either of the machines. To connect with Techline to another computer all you need is a browser and internet connection and you can enjoy a secure, reliable and quick connection to other system where you can have read only to full access depending on the requirements. As any business runs on secure relations, Techline has fully taken into consideration the security of both the parties,. It exchanges data using standard Secure Socket Layer (SSL_ and 128 bit Advanced Encryption Standard (AES) which is used by the banks for transactions. Thus Techline maintains a reliable and private connection between the users. Techline promises delivering excellent performance for your support team . The technical support team of your company can handle a client issues much faster by logging into their machine and thus providing the best service. Two way desktop sharing: Either parties can give controls to each other over a secure network. Remote Reboot and Reconnect: Technicians can reboot the remotely connected system and once restarted the system will automatically connect to remote desktop. Browser based solution: No software installations are required in either system. Just having an internet connection and web browser will connect you. Reporting tool: It generates a report including number of sessions, total session time, Ip address etc. for future references if needed. Multi monitor support: Works even if the client has two monitors connected to his PC. Auto scroll and auto scale: Automatically adjusts the connected desktop’s resolution according to your desktop. File and clipboard transfer: Files can be easily shared on a secure network without any interference of a third party software. Windows 7 compatibility: Is compatible with latest windows 7 64 bit version. 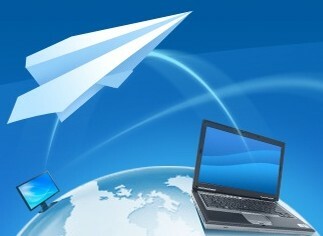 Techline comes at a really affordable price being cheaper than most of the famous desktop sharing application available. It comes with two types of licenses. Per- Session license: It follows pay as you use model. You can run multiple sessions a given time for a particular account. It can be connected to the same machine any number of times in 12 hours. It is best suited for personal needs. Techline is a low priced remote desktop software which takes care of your personal needs or help your business go brand making your clients contented with your services.